So much for masterplans!..... 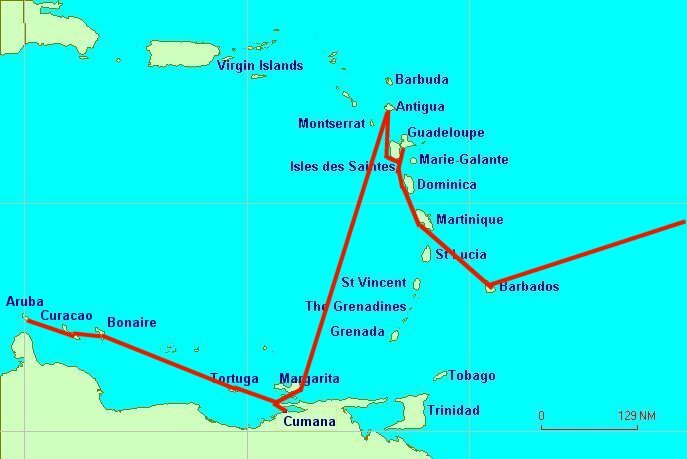 Our original plan was to go through the Panama Canal into the Pacific in April 2004, but one night in Antigua, Sue asked "Why don't we fly home for six months, just for a change?". Tom said "Don't be daft woman". But, next day, after careful consideration, it sounded like a good idea - it would allow us to top up the cruising kitty, get more time in the Caribbean and Pacific and feel what it's like to be cold again. Within days, we'd arranged cheap flights from Caracas to Glasgow (well, 500 quid return) and 6 months storage at a boatyard near Cumaná on the northeast Venezuelan coast. And on 25th March we cleared out with Antiguan immigration, pulled up the anchor and headed south. A Portuguese Man of War Jellyfish - beautiful pink colour but deadly sting. The float measures about 20cm in length. The trip started with us rolling in a cross-swell, but settled down to almost flat calm after a day or so and we ended up motoring most of the way - we carry 8 x 25 litre jerry cans of diesel, in addition to our fixed 80 litre fuel tanks. Day by day, the temperature gradually rose from hot to boiling hot! Four days after we set out, we arrived at the island of Margarita, just off the Venezuelan coast. We stopped there for one night, anchoring next to a poor sunken yacht with only the top half of the mast visible above the water. We arrived at the Navimca boatyard, near the town of Cumaná, around 5pm next day and were greeted by friendly staff, complete with shotguns! Venezuela does have security problems, and even small shops have armed security guards. There are also parts of the coast which are best avoided because of piracy. However, if you are reasonably cautious, it's just like parts of Paisley on a Saturday night (but without the swords). Next day, we were hauled out and chocked-up in the yard. We spent a week finding our feet in Cumaná, practising Spanish and getting Nechtan ready for a 6-month lay up. Laying up involved taking off all sails and ropes to avoid the ferocious ultra-violet degradation, stowing the liferaft and anything else movable down below and generally tidying up the boat. 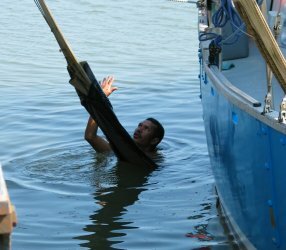 The guys at the boatyard don't guess where to put the lifting strops - they dive in and have a look at the hull. The Cathedral, Plaza Blanco, Cumaná. But we did find time to go into town and enjoy ourselves too! Cumaná is a colourful and lively place and safe enough as long as you don't go flashing your wealth around or wander into the back streets, such as those in the charmingly-named Mouth of the Wolf district! Cumaná is not a tourist town and we seemed to be the only gringos. We ate cachapas (corn pancakes) and filled arepas (a bit like thick tortillas) from street stalls and drank ice-cold Polar beers for about 12p each! One week after arriving, we were on a short internal flight from Cumaná to Caracas, followed by a long 10-hour flight home to Scotland. Who would have guessed it?